After a very warm first half of November, the cold easterlies that set up in the middle of the month were good news for winter climbers. The big decision was whether to go east or west. Going west meant better weather but limited snow, whilst heading east meant the opposite. East was a safer option for snow, but the winds were stronger and visibility poorer. In the event, most climbers opted to go east and climb in the Northern Cairngorms. 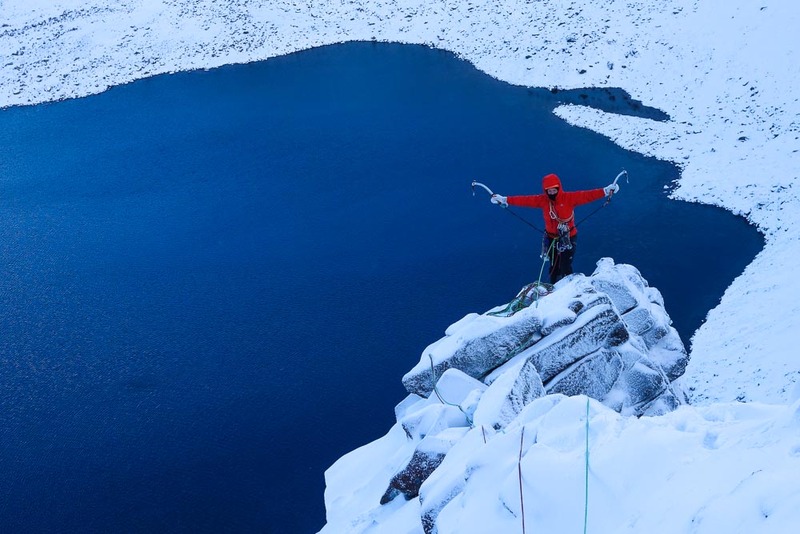 In Coire an t-Sneachda the popular early season favourites such as The Message, Fingers Ridge, Hidden Chimney and Pygmy Ridge all saw ascents. Harder routes climbed included Belhaven, Pot of Gold, Smokestack Lightnin’, Watch Out and Wachacha. Across in in Coire an Lochain the ever popular Savage Slit, The Hoarmaster, Hookers Corner and Western Route were all climbed as well as the more testing line of The Vagrant. Creagan Cha-no proved popular too, with climbers taking advantage of the new SMC mini-guidebook to the cliff. The classic lines of Jenga Buttress, Chimney Rib and Anvil Corner saw ascents, and the awkward looking Mac’s Crack saw an early repeat. Mark Robson and I headed into Coire an Lochain on Braeriach on November 25 where we repeated The Guardian with a new Alternative Start (IV,4). This avoids the technical and poorly protected crux wall led by Roger Webb on the first ascent, and reduces the grade to an enjoyable V,6. Across in the West, Tainted Elixir and Dr Noe on Ben Cruachan were climbed, and on Ben Nevis, Dave Almond and Helen Rennard made an early repeat of Hanging Garden (VII,8). This direct finish to Babylon takes the soaring arête directly above the Gargoyle Cracks and was first climbed by Greg Boswell, Jon Frederick and Stuart Lade in February 2017. This entry was posted in New Routes, Repeats and tagged Ben Cruachan, Ben Nevis, Braeriach, Creagan Cha-no, Dave Almond, Helen Rennard, Mark Robson, Northern Corries, Simon Richardson. Bookmark the permalink.